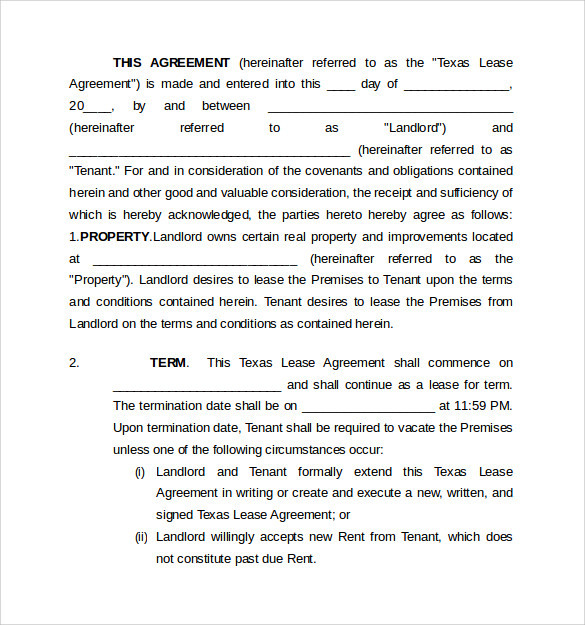 Texas Residential Lease Agreement is a real estate contract that allows the landlord to let someone else use and occupy the space in exchange for rent on a monthly basis. 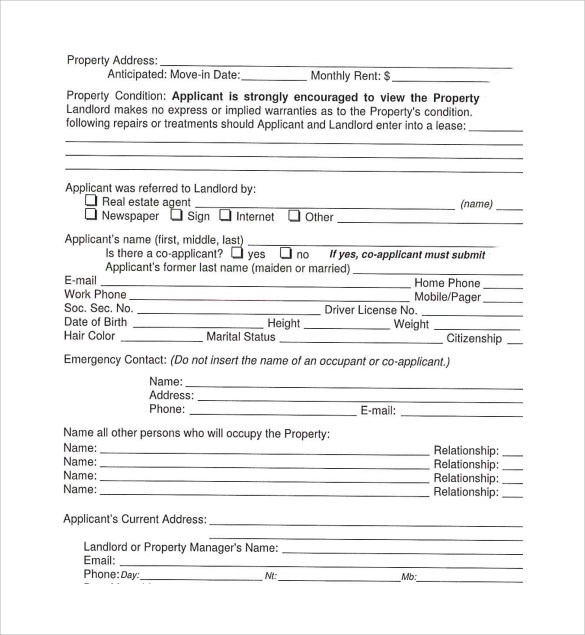 Before signing the agreement paper, the landlord must check tenant’s background, credit history, employment, income and rental history i.e. their past record with other owners and managers. If the landlord confirms that a particular tenant is good, not risky and able to pay the rent on time, he signs the agreement paper. 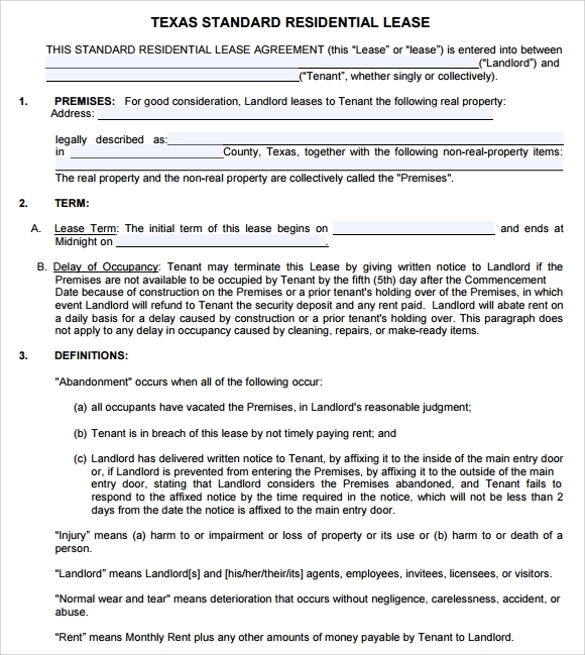 The Texas standard residential lease agreement is a real estate contract. It authorities the lessee to occupy residential space in exchange of cash on a monthly basis. 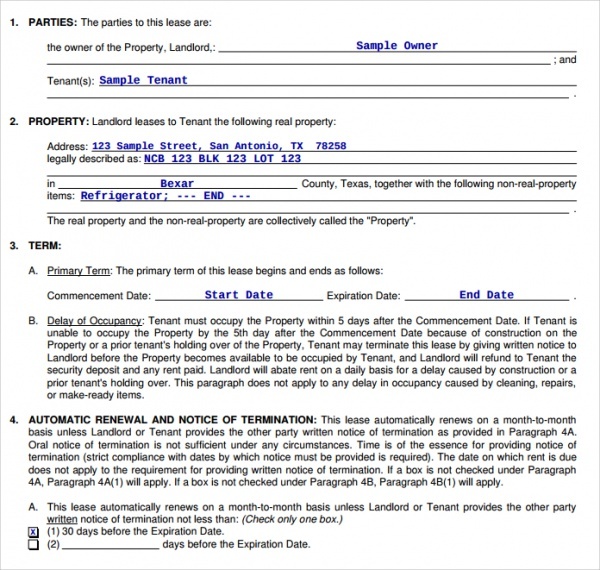 Texas real estate commission (TREC) contract forms can only be used by licensed sales agents or real estate brokers. 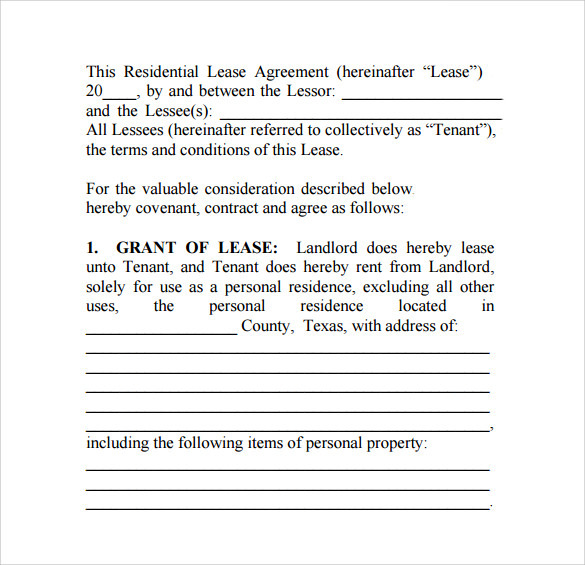 TREC does not show interest in promoting its own leasing agreement forms. 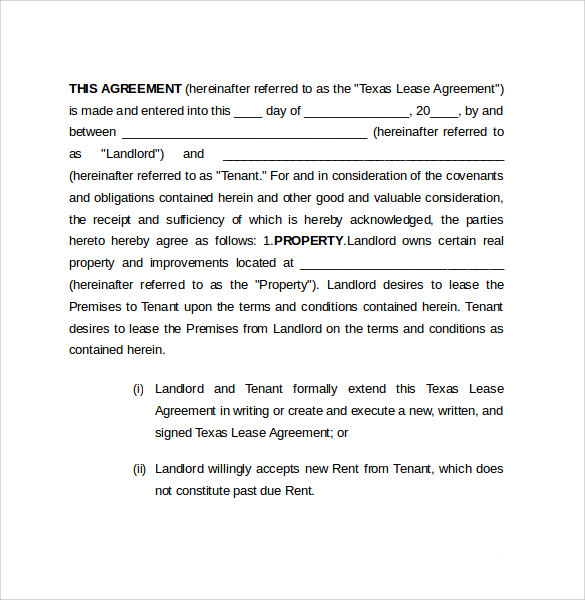 Introduction of both parties – It is required to clearly mention in the agreement the details of both the tenant and landlord. 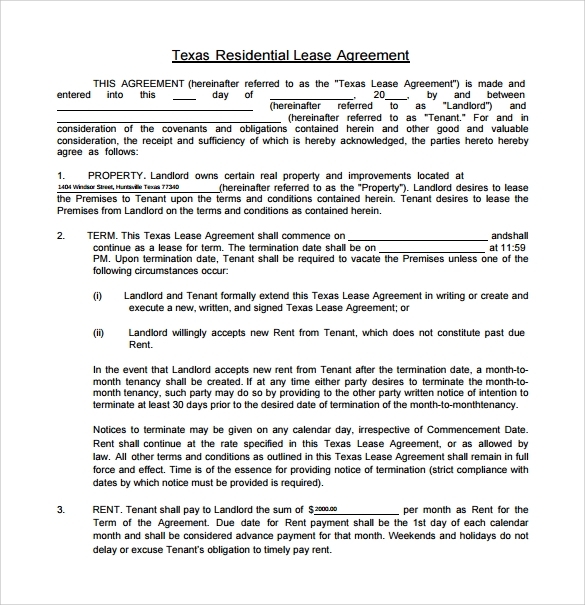 Term – It is the duration of the lease. The effective date when the lease starts and ends. Rent – It is the amount that the tenant has to pay to landlord as decided. Usually, rent is paid in the beginning of each month. Security Deposit – It is the fixed amount which is paid at the beginning as a security money. This amount is later used for any damage and loss to the premises during the lease period. This amount is refundable. Use of Premises – The premises shall be used and occupied by only tenants and their immediate family members. No part of the premises can be used for any other business or trade work. Conditions of Premises – It is the responsibility of the tenants to keep the premises good, safe and clean conditions as given to them. Alternation and Improvements – Tenants are not allowed to do any change in the premises by constructing any buildings or making improvements. Maintenance and Repair – It is the sole responsibility of the tenants to repair (if any damage occurs) in the premises and keep the sanitary in good condition during the lease period. Insurance – Landlords are not responsible for tenant’s personal property such as vehicles. 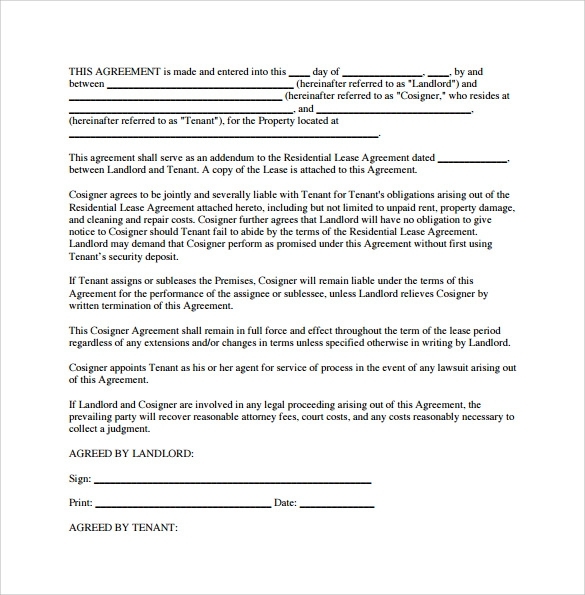 It is the responsibility of tenant to insure their property and share a copy of the same with their landlord. Animals – Tenants are allowed to keep a limited number (as mentioned in agreement paper) of domestic animals like dogs, cats etc. in their premises. 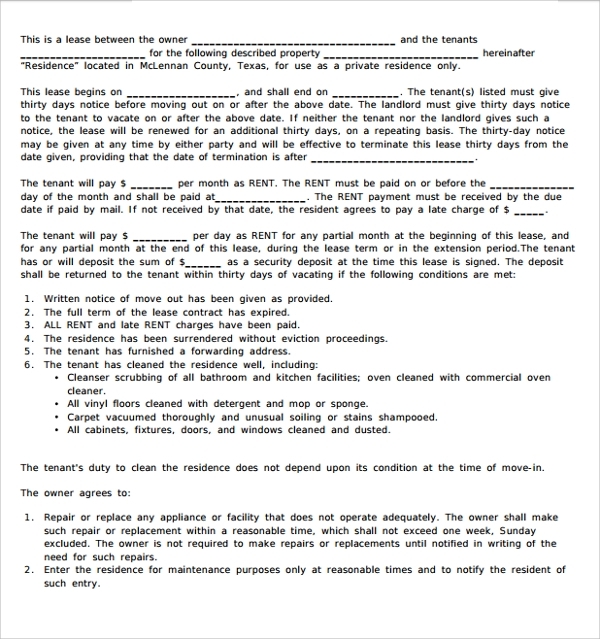 Indemnification – Landlord shall not be liable for any damage or injury to the tenants, tenant’s family, relatives, and guests who enter the premises. 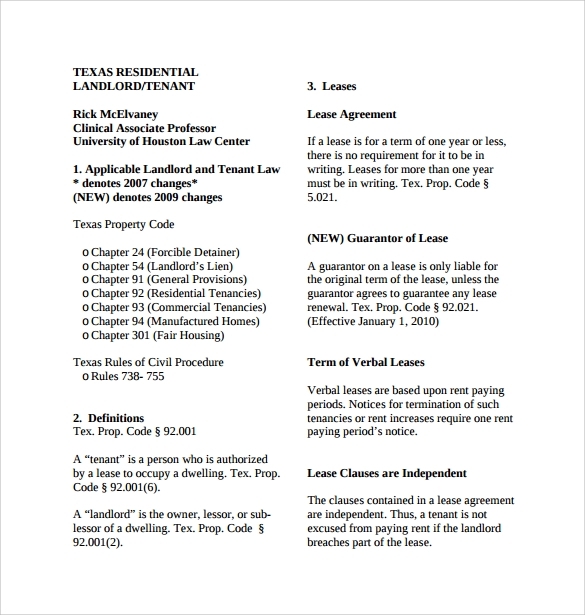 Above listed are some of the basic attributes of Texas Residential Lease Agreement while creating the agreement paper. There can be more clauses, based on the specific scenarios. 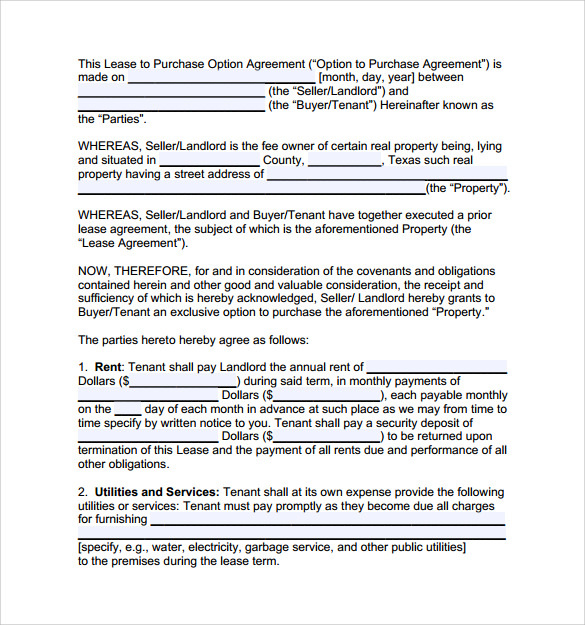 Different lease templates can be used for different purposes. We have multiple templates in place to suit your exact requirements. 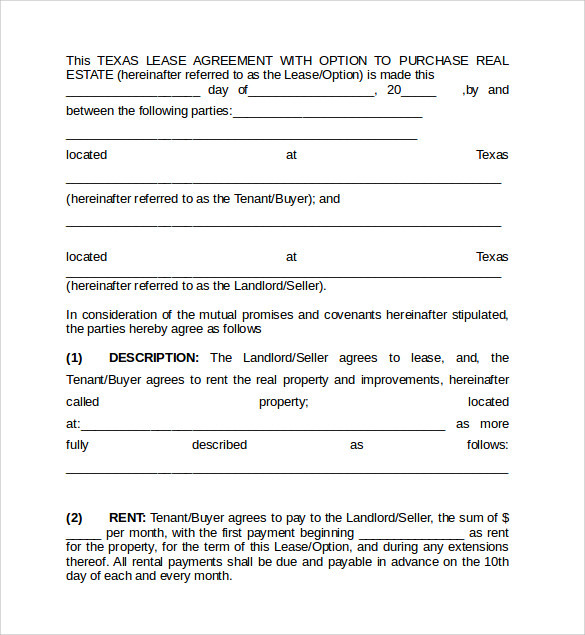 Texas Residential Lease Agreement Templates are convenient to use, easy to adapt and modify.